I will answer the question of how to improve Magento performance in a second, but first let us define what we will use to measure site speed. It receives html data from a server. It analyzes data and loads external files you might have on the page (CSS/JS/images/fonts etc). It builds what is called a DOM (Document Object Map). It renders the page (puts elements on the screen). Time to first byte (TTFB) or server response time: the time from when a user clicked on a link or typed in a site URL until the first bit of information from the server arrived. Start render time: the first point in time that something was displayed to the screen. Before this, a user was looking at a blank page. Fully loaded time: a webpage is loaded and no network activity is performed by a web browser. 0.1 second response time – a user feels that a system is reacting instantaneously. 1.0 second response time – a user notices the delay, but it doesn't bother him. 10 second response time – the limit for keeping the user's attention focused. For longer delays, a user will want to perform other tasks while waiting for the computer to finish. Server response time, or time to first byte (TTFB), consists of the time a browser's request goes to the server and the server response goes back to a browser (latency) and the time a server generates HTML. Google recommends having TTFB around 200ms. 1s TTFB is considered bad. To reduce server response time Magento codebase needs to be inspected. Here are my in-depth tutorials on how to optimize TTFB for Magento 1 and Magento 2. Host your website as close to your main audience as possible. If you sell shoes in London, do not sign up for hosting in Japan. Common sense. Do not think that SSL will impact your TTFB much. SSL negotiation time is negligible but the SEO benefit is obvious. Do not pick a cheap option here. It is the basis of your online store. Secure as many resources as you can afford and a bit more. You might want to get more CPU and RAM if you come to Magento 2 from Magento 1. 2.x needs more of it. A Magento site can't run on $5/mo shared hosting. If you want good TTFB and start render times, sign up for VPS or Magento-optimized hosting – Nexcess, Lexiconn and others. Do a Google search and see what others recommend. If you plan on running VPS or a dedicated server, you need to optimize server software and a database. Options for your server setup are endless and depend on your expertise. You can configure NGINX, Apache, Varnish, HHVM, php-fpm, Redis, memcache. Disabled MySQL query cache. Modern MySQL servers come with query cache disabled by default. Enable it. By the way, it is one of the first things to check on my magento performance optimization checklist. Slow disk I/O. Make sure your host provides you with SSD (solid state disk) storage. RAM shortage. When the system runs out of RAM, it puts data on disk (swap), making things slow. PHP code and template files are the main reason for poor server response time. To help optimize Magento websites, you need to profile the code and identify parts that slow the site down. Magento comes with a built-in profiler. You can also use the third-party extension Aoe Profiler or sign up for the NewRelic application performance management tool. Here is a detailed tutorial on how to optimize TTFB with Magento profiler. Don't do that. It’s better to construct your collection to have all the data you need. Magento model loads are expensive. Start render time (SRT) is the first point in time when a user sees the content after requesting the webpage. It could be a background image or some text blocks, but from that time on the user knows something is happening. In my opinion, start render time is one of the main factors by which a user judges how fast the site is. According to the 3 main time limits [study] I mentioned earlier, we need to keep the start render time to around 1 second. After we understand what start render time is, we have options to optimize it. This will help us speed up Magento and have a better website. Compress your html page so that a browser has fewer kilobytes to download. Enable gzip compression on the server side – see instructions for your web server. Confirm you have gzip enabled by this online testing tool. You need to restart NGINX for the changes to take effect. Domain sharding is splitting external resource files (JS/CSS/images etc) across multiple domains. Why bother? Because a browser can download files in parallel but has a limit per domain. For example, Chrome can do 6 concurrent connections. If we can split images, js, and css files across multiple subdomains, we can make a browser download resources a lot faster. 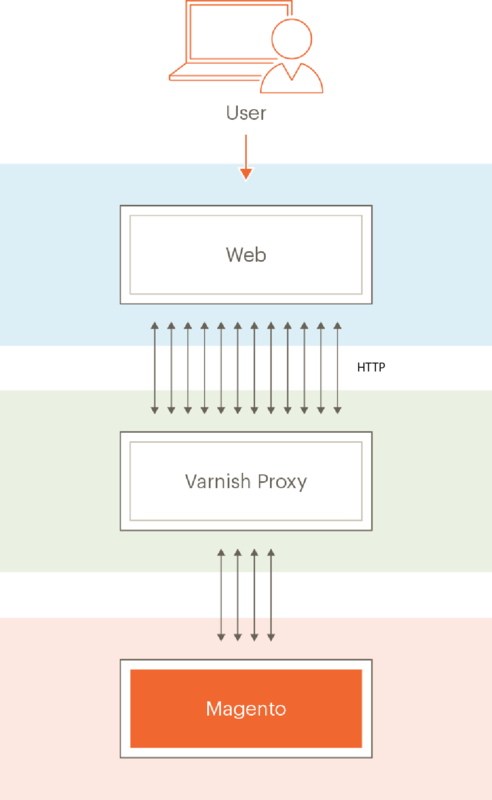 UPDATE: domain sharding is not needed when you use HTTP/2. And the use of HTTP/2 is recommended. Next, point them all to the same IP and file folder your main domain is pointing to. 3. Flush cache and confirm your resources are now served from subdomains. HTTP/2 is the new generation of Hypertext transfer protocol. It has many performance improvements that allow a browser to load a webpage faster and be less resource-intensive. HTTP2 is binary, instead of textual. It is fully multiplexed ( can send multiple requests over the same connection ). It can use one connection for parallelism ( meaning it can load resources considerably faster). It uses header compression to reduce overhead. It allows servers to "push" responses proactively into client’s browser caches. You will need Nginx 1.9.5 up. All you will have to do is to add http2 parameter in listen directive. Above-the-fold content is the part of a page that you see before you scroll down. It is also called visible content. Prioritize visible content – load and display it as quickly as possible. The less time a browser spends parsing <head> section of your webpage the better. Ideally, only JS and CSS need to display above-the-fold content which should be put in between head tags. Analyze the page HTML and make sure visible content goes first. If you are familiar with Linux and Bash this tip will work for you. In an attempt to make internet faster, Google created PageSpeed Extension. This is special software you plug into your server. It compresses images on the fly, as well as other things needed to speed up a site. Setting up the PageSpeed module sounds too techy for you? Google has a solution: Insights. It is a free magento speed test tool. At the bottom you will see a link to download optimized images for the page tested. It is a tedious task to compress images for all the page using Insights. Done once, it could make a huge difference in how fast your site loads. PS: There are various Magento image compression extensions available on the market. They all require professional installation. If you want to try some of them, make sure it is installed by an expert. UPDATE: I found this online tool ImageEngine which looks promising. Check it out. Here is more info. Content Delivery Network (CDN) is a web service to host your Magento site external resources likeCSS/JS files, images, fonts, etc. It aims to serve those files a lot faster than you can with your own server. I think that CDN is better than any magento image optimization extension. Magento supports CDN by default, no extensions needed. Go to System > Configuration > Web and set secure/unsecure URLs for media, skin, js resources. There are many CDN providers to choose from: MaxCDN, KeyCDN, Amazon CloudFront and others. If you have done start render, first byte, and document complete times optimization, there is a final step – fully loaded time improvements. First, keep the number of 3rd-party JS scripts to a minimum. Second, do not rely too much on jquery.ready. Choose onLoad events carefully. Don't put CPU intensive tasks in jquery.ready – it slows down page loading. Well-known JS code like Google Analytics and Facebook are all optimized and performance impact is negligible. Others – use with caution and always test. Let me first say that JS Bundling is useless if HTTP/2 is enabled. Second, it does more harm than good. The bundled JS file is huge in size (5-13Mb), which makes mobile speed suffer significantly (here is a bug report). BTW, are you still running Magento 1? Transition to Magento 2 right now before the Magento team stops releasing security patches. My guide will help. I would list Run Store in Production Mode as a priority on any Magento speed optimization checklist. M2 has three running modes: default, developer, and production. Production mode is the fastest one. Make sure you always put your store in production mode. It will speed up Magento 2 significantly. You will need to obtain SSH (Secure Shell) credentials to change running modes. 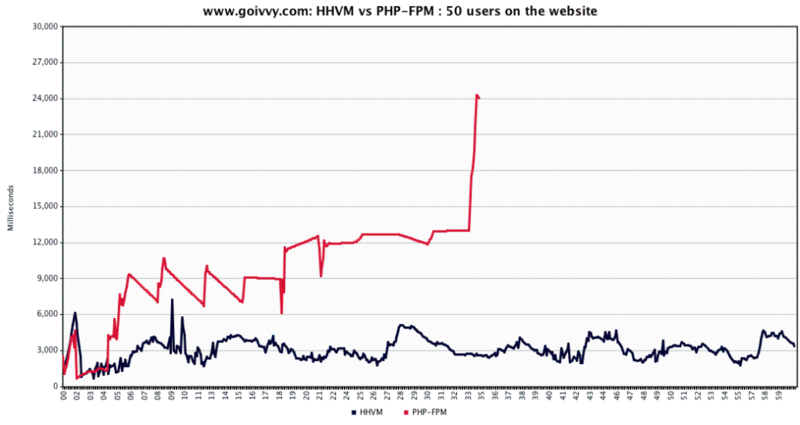 This is what Facebook is using to make its pages incredibly fast (yes Mark Zuckerberg uses PHP). HHVM is a special server software that you can install and hook up with Magento. It replaces php-fpm and can work directly with Nginx or Apache. As you can see I had 12 / 3 = 4 times increase in performance! ...doesn’t support all features of PHP7 so it might not run Magento 2 well enough. ...doesn’t have ionCube support. If you use encoded extensions you are out of luck. What are these known problems? The problem is with sorting implementation of HipHop VM. This involves a different array implementation of HHVM. Magento comes with some shipping carriers (like FEDEX or USPS) enabled by default. Even if you don’t plan to use them, they still send requests to external gateways thus slowing down the checkout process. Here is a little experiment to give you an idea…. I took a stock Magento 1.9 and went to a checkout. As you can see, we are talking about 600 + 424 + 406 + 518 ~ 2 seconds of wasted time. Go to System > Configuration > Shipping Methods (Magento 1) or Stores > Configuration > Sales > Shipping Methods (Magento 2) and disable carriers you don’t use. As you might notice, when running a Magento store there is an estimated shipping cost block on a cart page. Reason? It increases page load time. When you change a payment method on a checkout page, Magento 1 recollects shipping rates. Getting rates is a time-expensive procedure. If your shipping costs don’t depend on payment method, you might want to disable that behaviour. Open up app/code/local/Mage/Checkout/Model/Type/Onepage.php and find function savePayment. Less extensions = faster Magento speed. This is a Magento 1.9 optimization hack. It also makes sense if most of your products are configurable ones. It speeds up checkout process by 50ms per item. Suppose you added 10 products to a cart - that would be 0.5 sec off! Not bad. Open app/code/local/Mage/ConfigurableSwatches/Model/Observer.php and find function loadChildProductImagesOnMediaLoad. FPC caches whole pages making time to first byte well under 0.5 seconds. Magento 2 comes with full page cache functionality. Magento 1 doesn’t. FPC is a Magento speed extension that does make your visitors think your site is incredibly fast. Magento is powered by an interpreter engine called PHP. PHP had a major upgrade not so long ago - the version 7. PHP7 runs faster than the previous PHP5. Ask your system administrator if you are using the latest release. If not, upgrade to give your online shop a performance boost. Varnish is a special server software that can cache and serve content super fast. First, install Varnish on a server. Second, use Nexcess Turpentine extension. It is free and easy to set up. Here is an official github page with all Installation and Usage pages. Magento 2 can use Varnish natively. You still have to install it on your server. On that page at the bottom you will see Export Configuration buttons. Export VLC file for your version of Varnish and ask your system administrator to upload it to the server. Now go and browse your website to see if it is fast enough. This tip only makes sense if you are managing your own server. If you are on a managed hosting plan (as you should be),go over to the next section. First, collect DB statistic using this little perl script - mysqltuner. Go over to “Variables to adjust” part and set my.cnf configuration variables accordingly. Where do you find my.cnf? It is usually at /etc/my.cnf. If you want to know how to increase Magento speed, this is what you should start with - a 3rd-party plugins audit. It’s no surprise that custom extensions make Magento slower. On the one hand, Magento core was written by programming experts. There is little to no room for performance improvement in a stock installation. On the other hand, various 3rd-party plugins are written by average coders at mostith no appreciation for performance benchmarks. The rule of thumb here is to have as less custom modules as possible. The ones you do have have to be inspected thoroughly. Include performance benchmarks into your workflow. Every time you add an extension from Magento, connect or roll out a new feature, see what impact it has on site speed. Does it slow Magento? Debug or go for another module. 1. webpagetest.org – provides you with page-loading waterfall charts and tons of other useful information. Supports mobile browsers. 2. Google Chrome Timeline – helps you analyze frontend performance. Takes a little time to get use to, but once you are familiar with it, it gives you valuable insights into why your Magento is slow. 3. 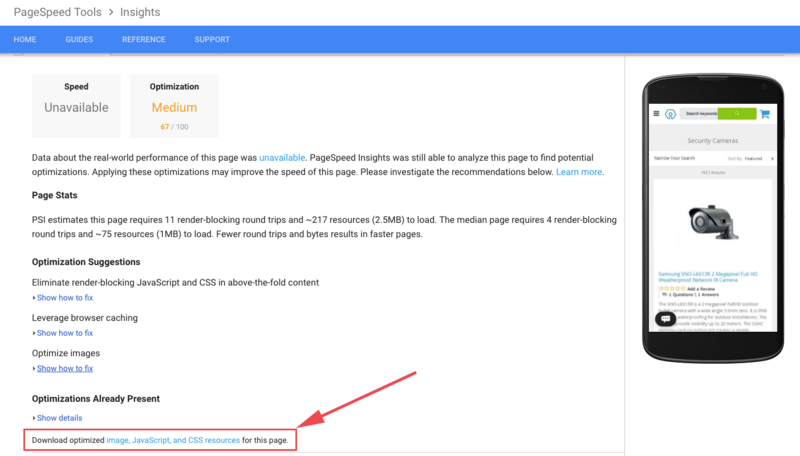 Google PageSpeed Insights – an online tool that tells you what to do to boost site performance. Work on suggestions by Google and improve Magento speed. Does all these 34 tips seem too complex for you? Try my magento speed optimization service. I have experience. I have references. We could use a guide to optimize Magento 2 local dev env, as with "developer" mode on it takes ages to develop something on it. @Hristo one doesn't exclude another. You can use varnish with google pagespeed module without any specific modifications. Could you tell me how to use Varnish and Google Pagespeed module together? @Hristo please submit a ticket and we'll go from there. Our new Magento 2.2.3 project is almost ready. Our hosting is Managed Cloud VPS and we would like to know could you make all neccessary server setings and optimizations. We became quite proficient at speeding up mage1 by combining scripts. M2 now loads >150 JS files. Some sites it's over 200. Whilst I get they are Asynchronous, It still seems excessive to be making that many requests. The default bundling option includes the massive zxcvbn.js file which is almost 1Mb. Have you found a way to minimise the number of scripts? Thank you very much for sharing this wonderful content regarding Speed up Magento website. Hi! Thank you for the useful information. Good article that I've bookmarked. I've implemented a lot of these actions above, but good to know there are still some improvement points left. I agree with Steve that HHVM should not be used with M1. And a good FPC decreases load times substantially, but offcourse does not improve the uncached pages loadtime. Well, I have used Cloudways Magento Full Page Extension powered by Amasty to speed up the Magento performance. I avoided using heave theme and used trusted extensions to accomplish some tasks on my ecommerce store. The store now loads within 2 seconds, and I am delighted with the reviews of my customers about the performance of the store. Magento is an ecommerce heavy open source platform. It is a big problem for you when your magento store runs slowly and at that time you have to setup it properly. Tottaly agreed to all the above points foe increased magento page speed but one point we are forgetting is what happens if we clear cache in middle of the day when customers are actually hitting the site, best solution is to have cache warmer that quickly crawls and puts the page back under cache. Some great tips for optimizing Magento's speed. 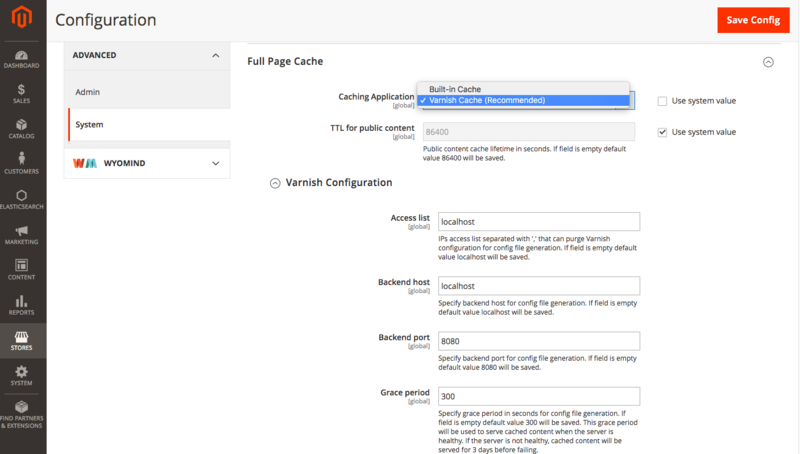 Few more things that you can do to tune the performance are: install Turpentine – Varnish Cache plugin and configure Memcached with Magento 2. You will notice a significant increase in speed. what did you mean by " I’d take care with infrastructure suggestions that are outside Magento’s requirements ( so no HHVM, > 5.4/5/6 on Magento 1.x and so on ). Don’t want to get sued!"? master-slave setup for magento is a great way to speed things up - master for writes, slave for reads - magento supports separate reads/writes databases. - If you split database and web server then you've not only added a new point of failure ( and potential performance problems ), but you now have to build up / tear down TCP connectivity to extract data from the database, rather than ( with a properly configured server ) just pick it out from local memory. - it's very unlikely that your site will ever become busy enough to require a master / slave database setup. Also remember that this will slow things down if you're not very careful indeed. - there are many more file types that can take advantage of browser caching. - domain sharding is pointless with use of a CDN... just hand the heavy lifting over to them and let them sort it out. - I'd take care with infrastructure suggestions that are outside Magento's requirements ( so no HHVM, > 5.4/5/6 on Magento 1.x and so on ). Don't want to get sued! - tuning of the OS? - and finally what about caching!